Man of Steel came out just over two weeks ago. I've seen it twice and the more I think about it, the more I'm of the mind that it's not only the finest Superman film made to date, it's also the best comic book movie thus far (tying with The Avengers and The Dark Knight). Dang near everything about Man of Steel is spot-on perfect: from Henry Cavill's performance as Superman to Zack Snyder's direction to the sight of Metropolis getting the slats beaten out of it, to the beautiful and epic score by Hans Zimmer. I'd wanted to write a review, but kept getting bogged down with stuff during the past several days. But who says that I have to be the only one writing a movie review around here? I have to say I really liked Man of Steel. I thought it was a great new way to tell the Superman story. There were a lot of people, and critics that did not like the movie, and that is fine we are all entitled to our opinions, and reasoning. The problem comes from some of the things I read are either nit picky, or can have a justifiable reason for why the movie was done the way it was. Before I get started I have to warn that there will be spoilers in this, so if you have not seen Man of Steel then do not read any further. The first issue I have read was about the characters, and how some where "wooden" or did not serve the purpose they should have. I agree that they should have focus a bit more on Zod, and show him more as a foil for Superman. For the rest of the characters I felt that they were showcased properly. One of the characters that people saw a problem with was Perry White. I heard things like " He should have been in it more." I have also heard that all he was just a comic relief. I don't know about that last one. I saw his character as being in there enough to introduce him, and show the type of person he is. He cares for his employees, and what is right. He is stern, and kind of a father figure within the Daily Planet. For his time in the movie that comes down to Superman not become Clark Kent "Mild Manner Reporter" till the very end. There was no reason for him to be in there more than he was. Next is the fight scenes. I will start this one by saying that it took me a while to respect what Christopher Nolan did in Batman Begins. I am a martial artist, and when it comes to fight scenes in movies I like to see the movement, the technique, the art in motion, so in the beginning I did not like it. My respect came when I saw what Nolan was doing. He wanted us to see Batman's hand to hand from the eyes of the criminals he was beating. The quick blinding camera shots represented Batman coming in, handling business, and you on the ground before you know what is going on. I felt the same thought was put into the fight scenes in Man of Steel. We know that Superman is powerful, but he is also fast, and those from Krypton would have that same power and speed. I feel that Zack Snyder, David Goyer, and Chistopher Nolan saw it as what would a fight with these aliens look like from the eyes of a human being. I'm sure the fights would be hard hitting, and near invisible to the naked eye. The death of Zod. I read that someone did not like it, there was not a point to it, there was another way, Superman would not do that, etc, etc, etc.... I think the first question I pose is Batman killed Ra's al Ghul in Batman Begins. Why is there not a problem with that? Batman does not kill, but he left Ra's in the train car knowing the outcome. He may not have pulled the trigger, but he did nothing to stop it either. Superman did kill Zod in the comics. I will not go that route though. I look at it in two ways. One is that they set up Zod's character in a way that the only way to stop him would be his death. He said that he was made for one purpose, and he would stop at nothing to fulfill that purpose. If you banished him back to the Phantom Zone he would find a way back. It is him, his nature, his hard wiring . The second is I feel it was a statement. It was Superman making a choice between his past and his future. Almost like him saying that Krypton had its chance now it is time to let Earth have its time. The problem that I did have with this is that I felt not enough time was spent on Zod's death. This is significant, this is the first time Superman took a life. I did not like the fact that he killed Zod, yelled, cried in Lois's arms, and that was it. There should have been more. There should have been a separate scene where he talks to Lois, and tells her that he would not take a life. There is a lot of that in movies now where significant characters, are killed, and not enough time is devoted, or the death does not fit the person in my eyes. The death of Rachel Dawes in The Dark Knight bothered me. She was Bruce Wayne's childhood friend, and love interest. She is the one that Bruce was going to give up the cape for, and the aftermath of her death was relegated to Bruce looking out the window. Nolan said that there was supposed to be a funeral scene. It was cut because of time, and how it took away from Batman finding the Joker. Keep the funeral in there. It was needed. You could have cut the barge scene a bit. No matter how many times I see that movie the barge scene is the scene that I always start to nod off. I can forgive Man of Steel for this because this is the first movie. They have another movie in which to explore the death of Zod impacting Superman. Superman is not Superman. Superman is supposed to be a "boy scout" For this you have to look at the time in which Superman grew up. When Superman first came onto the scene good guys wore white hats, it was apple pie america. That character was widely accepted.I like what my friend said. If you want Superman to be a boy scout watch Superman Returns. This Superman grew up in the 80's, and 90's. He grew up in a time of question, and conspiracy theories. He grew up in a time of who can you trust. It is only fitting that his character would be a little rough around the edges. I saw this Superman as a good upstanding character he was just more guarded than the Superman of old. Lastly, this was not a new telling of the story. Alien baby rocketed to earth from a dying planet. grows up with powers far beyond any human. Uses said powers to protect humanity. Wealthy boy watches parents murdered grows up to become masked vigilante . I know it seems as though I am beating up on the Nolan Batman trilogy. I am not, I loved all three of the Batman movies. My problem comes in where we can accept the fact that there was not really a new telling of the Batman mythos, but we criticizes the telling of the Superman Mythos. Characters like that are iconic, and there is really no change to the heart of what makes those characters. The world, the people around them can change, but the outline of the story needs to stay the same. No matte how many reboots of comic book characters they do, the overall outline of the character will never change whether it be Batman, Superman, Spiderman, Ironman, etc... At its core the origin will be the same. That is enough of my ranting. I really liked Man of Steel. I just feel that as critics you lose sight of the movie experience because you are trained to look at the faults. There are bad movies out there, but Man of Steel was not one of them, and just remember this is the first of a franchise that is supposed to spawn a Justice League movie. Fonzo and I are planning on seeing Pacific Rim together in a few weeks, so don't be surprised if he writes a review of that for this site! Next up are some thoughts by someone who is no stranger to these pages: my girlfriend Kristen Bradford. On our way back from seeing Man of Steel, we had quite a discussion about the film and Kristen came up with... well maybe I'm being biased but I thought she had some positivalutely brilliant thoughts about it. I asked her to do a write-up, and she turned this in over a week ago but I hadn't been able to post it until now. So here are Kristen's thoughts and commentary about Man of Steel. Take it away, Kristen! 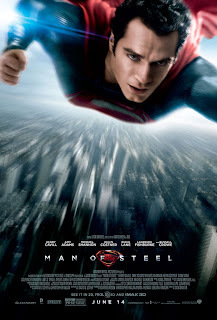 I had been wanting to see “Man of Steel” after seeing the trailers – it looked so much more promising than 2006’s “Superman Returns.” Perhaps even better than the Christopher Reeve films (which I vaguely remember, so I can’t accurately compare them). Then Chris saw it Friday night, unsure of what to make of it. So when we went Saturday night, I was optimistic but prepared for the worst. I must say that it was one of the best films I’ve seen in a long time. From the time the end credits rolled until we got back to Chris’ house, we were discussing themes and elements that we both noticed. Before I get into this, please note this may be spoiler-y, so don’t read any further if you haven’t seen it yet. And if you’re not a Christian, well, I hope you respect my thoughts and understand where they are coming from, because I saw a lot of parallels between this film and the Christian faith. That being said, if you have not seen it and you’re not a Christian, don’t be turned off from going. The Christian elements in the film don’t come across as “beating you over the head” with it. It’s more subtle. I view this film as sort of a cautionary tale. One that is warning our society of what our future can hold. When the film starts, we see Krypton, not far from the end of their world. As the movie goes on, we learn that their people used to be explorers, colonizing distant planets and learning more about the universe around them. By the time of the events of the movie, the outposts are long dead, abandoned for unclear reasons. Children aren’t born, but artificially created (Clark, or Kal-El, is the first natural birth in their society in years, maybe even centuries). Babies are created to play a specific role – like to be in the military, for example. Their people have no choice in what role they will play in life. And that is General Zod’s downfall at the end. He knew nothing else except to protect Krypton, and he would do so by any means necessary. He could do nothing else. Krypton represented a society that was hell-bent on control. Their obsession with control led to their destruction. Which is why Jor-El could not go with his son – he knew he was part of the society that brought them to their end in the first place, and wanted Kal-El to learn a different and better way of living life. Kal-El grows up as Clark Kent, knowing he is different from everyone else but not realizing why until he is a little older. Throughout his life, he struggles with his outcast role. He strives to help people because he is able to, but in turn has to remain hidden and, as an adult, moves from job to job when he makes his powers known. But he discovers his own destiny. He is not forced to be a farmer, or a doctor, or anything else. He makes his own choice. And his choice is to save the human race, to use his powers for good, if you will. And that’s what we all need to do sometimes. When the odds are against us, or when things seem unclear, there is a time where we just have to take a leap of faith that everything will turn out okay. In this movie, I’ll just say it gets worse before it gets better! One thing that stuck out with me was the pro-life element. Yes, you read me right. Krypton, for some reason, looks down on natural births. When Jor-El tells Zod they had a naturally born son, Zod yells “heresy!” It makes me wonder if this is the path our society is going towards. I hope not. When we try to control how future generations are made, that messes with the natural order of life. I highly recommend this movie. And not just for Henry Cavill’s abs! It is a very well-done film (though it did get a little CGI-crazy in the climax) and an interesting take on the character of Clark Kent. We always see Superman as confident and ready to fight for justice. In this story, we have to see him work towards that confident superhero. Thanks to Kristen and Fonzo for their contributions!